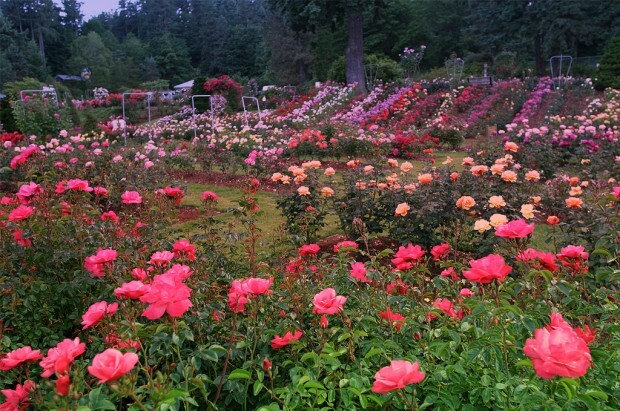 Portland is known as the “City of Roses”, and for good reason! The International Rose Test Garden was began in 1917, as a test bed for new varieties of roses. Today the garden has more than 7,000 different rose plants, stemming from over 500 varieties. The roses bloom throughout the year, from April to September, with the peak generally occuring in June. The Garden features four different collections. The Shakespeare Garden, contains other plants mentioned in his works, in addition to varieties of roses named after the characters in his plays. The Gold Medal Garden is a collection of roses which have won awards, and is a site frequently used for weddings. The Royal Rosarian Garden pays tribute to those who serve in Portland’s annual Rose Festival, naming a rose after each person, after they are knighted. Finally, the Miniature Rose Garden is a collection of some of the finest miniature roses in America. The flowers are in elevated beds, and feature many unique varieties. The International Rose Test Garden isn’t just known for its roses though. The garden also provides a nice view of downtown Portland, the Willamette River, and on clear days, Mount Hood and the Cascade Mountains. The garden also contains an amphitheater, which hosts plays and classical concerts throughout the year. It is also a oft-used spot for picnics and Frisbee games. The garden, along with its accompanying gift shop and information center can be found at 850 SW Rose Garden Way, Portland, OR 97205, with more information available at their website.